Cushendall beach is a picturesque sandy beach backed by grasslands suitable for picnics and set in a bay to the north of Cushendall. Uninterrupted views to the Mull of Kintyre in Scotland will demonstrate that, at the closest point, Scotland is only 12 miles away. A well equipped play park will keep children amused for hours whilst an outdoor gym will cater for adults looking for a challenge. Nearby, Cushendall Golf club is a very active club and attracts enthusiastic golfers from near and far. Plenty of free car parking is available. Waterfoot beach is a 1 km long strip of sand at the foot of the Antrim Glens and is one of the most popular on this stretch of the Co Antrim coast. Despite its relative popularity Waterfoot beach still manages to retain a fairly tranquil laid-back feel. The beach is comprised entirely of sand and is backed by extensive dunes to the southern end of the beach and the village of Waterfoot to the north. The backdrop of Glenariffe makes for some impressive scenery, particularly the view looking southwards along the beach. 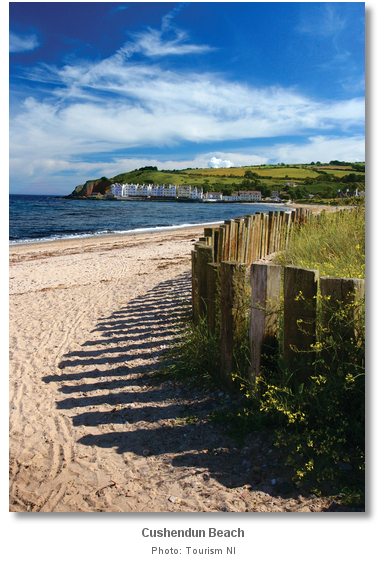 Cushendun beach is in a wide sandy bay backed by the picturesque village of Cushendun. This small village, mostly owned by the national trust, is situated at the mouth of the river Dun (The Brown River) and the foot of Glendun. It is a popular destination on the Antrim coast route for families and travellers alike. Facilities such as tea rooms and a pub, free parking and public toilets are available.